Just in time for Thanksgiving, I created these two simple cards to send to family. 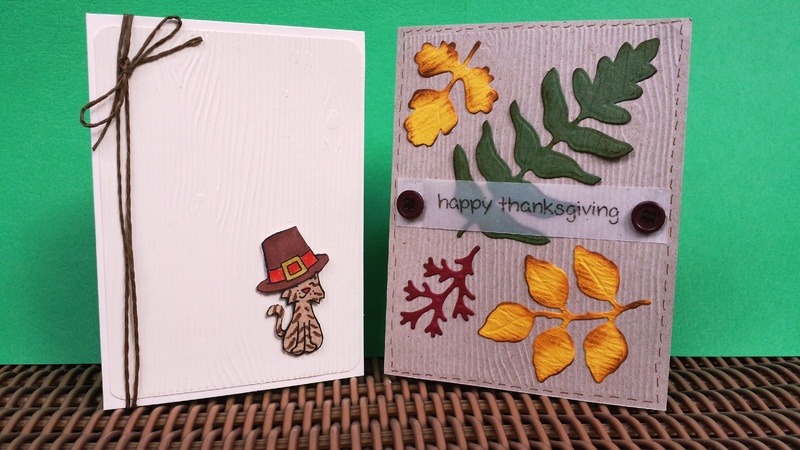 On both cards I used a wood grain embossing folder to create some natural texture. The first card is extra clean and simple with a tone-on-tone cream card base and layer. On a separate piece of kraft card stock, I stamped the cat from Lawn Fawn’s Critters in in the Burbs stamp set. I used a Distress marker in Vintage Photo to add some quick stripes. I also stamped on white card stock the pilgrim hat from Lawn Fawn’s Hats Off to You stamp set. I colored it with Distress markers and a little bit of water in a water brush. I cut both out, edged them with a black marker, and adhered them to the bottom corner with dimensional tape. Ta-da, a Thanksgiving kitty! The final touch was a brown piece of twine wrapped vertically, and on the inside, a Happy Thanksgiving sentiment in brown ink from the Hats Off to You stamp set. For the second card, I was inspired by Lawn Fawn’s recent blog post that used die-cut fall leaves on a simple card. I used my Spellbinders leaves die set to cut out these leaves in a variety of shapes using textured paper in yellow, green and red. I used a sponge dauber in Vintage Photo Distress Ink to add an aged look. I adhered these to a card base from Neenah Desert Storm, with the front panel embossed in wood grain. For the sentiment, I stamped the Happy Thanksgiving greeting in brown Staz On ink on a strip of vellum. I adhered the sides with tape, which I covered with two brown buttons to hide the adhesive. I also created faux stitch lines around the card using my Distress Marker in Vintage Photo. What do you think? Which card do you like better? I think the cat one is my favorite – so cute with the hat that is slightly too big and askew! I can’t believe the Online Card Class Summer Camp 2 is almost over. It’s been a full three weeks with lots of wonderful assignments and inspiration. Unfortunately, I have been traveling and not able to devote as much time to participating as I would like. I will catch up eventually! This assignment is from Week 3, Day 1. We had to choose at least four colors from a palette of tan, brown, light purple, a brighter purple and a turquoise. Per the instructor’s example, I created a background layer using two sheets cut at an angle. 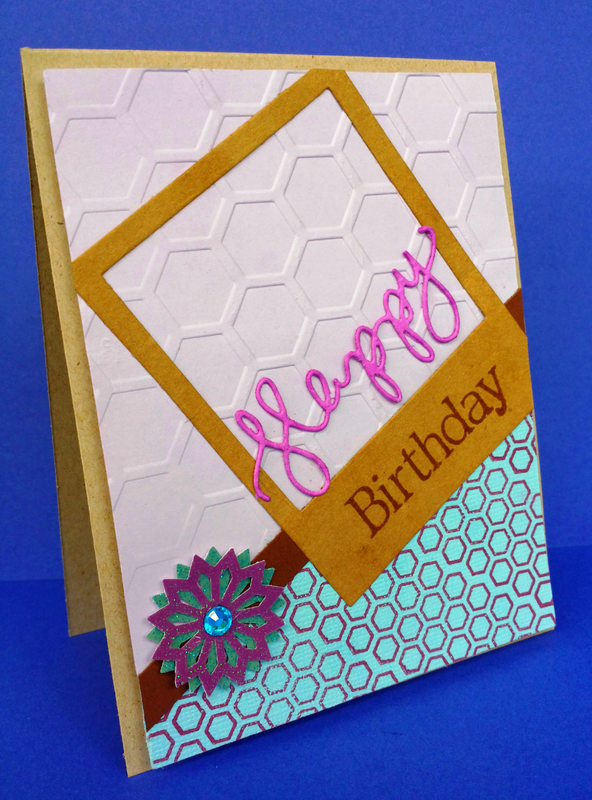 To create a honeycomb design, I stamped a sheet of light blue card stock with purple ink and a Lawn Fawn Interlocking Backdrops stamp. I attached this to another a light purple sheet of card stock that I had dry embossed with a larger honeycomb pattern. I covered up the seam between the two papers with a narrow strip of brown paper. Say cheese! A birthday card with a Polaroid focus. For the focal point, I used my new Polaroid die from Lawn Fawn. I cut it out of craft paper and stamped the birthday sentiment in Versafine brown ink. Then I die cut three sheets of bright purple card stock, adhered together to make a thick layer, with a Simon Says Stamp die cut, Oh Happy Day. I adhered the Happy portion with Tombow Mono Multi Glue across the midpoint of the frame. For a bit of sparkle, I punched two flowers with my Martha Stewart punch in a glitter card stock in coordinating shades of purple and blue. In the center I adhered a turquoise rhinestone. The entire layer was attached with foam squares to a card base from Neenah Desert Storm craft paper. I don’t think I would have put this color combination together on my own, but I think I like the juxtaposition of the brighter pastel colors with the neutral shades of tan and brown. What do you think? Thank s for looking! Here’s another summer-themed greeting card, this time using Lawn Fawn’s Summertime Charm stamps. Catching fireflies with Lawn Fawn’s Summertime Charm stamp set and dies. This is another new favorite stamp set. It totally brings me back to camping in the summer and catching fireflies to watch them light up the sky. Of course, my sisters and I called them lightning bugs instead, just to rile up my mother. She is phobic about lightning and thunder to this day! 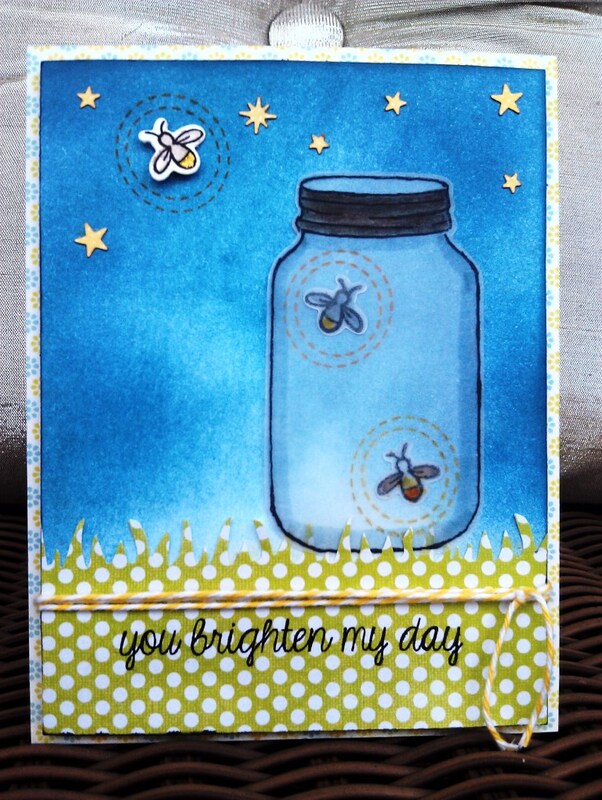 I used vellum for the jar and the fireflies inside, which I colored with my Tim Holtz Distress Markers. I cut them out with the corresponding Summertime Charm dies. The escapee firefly was stamped on white paper and popped up using adhesive foam. I added some Diamond Stickles to his backside to give him an extra glow. Fly away, lightning bug, fly away! The background was made using an ink tool and various Tim Holtz Distress Inks in blue shades. I was going for a twilight look. The stars were made from my Martha Stewart punch that has lots of little star shapes; I use that punch a lot, as stars add a fun bonus to a lot of cards, especially masculine ones. I used my Fiskars grass punch on green patterned paper to make the grass and then wrapped that a couple of times with yellow and white twine. For the final touch, I stamped the “You brighten my day” sentiment, which comes in the same stamp set, in black ink. I adhered that layer to a background paper from DCWV’s Citrus Matstack with thin foam adhesive and a white card base. I gave this card to my younger sister when I visited recently. She immediately laughed and talked about how much fun we had trying to catch these fireflies. Funny, we rarely succeeded; those fireflies are fast! Good for them! Please let me know what you think. Happy summer time–and firefly catching–to you!